GAC is a global provider of shipping, logistics and marine simulation training. As one of the world’s largest ship agencies, it has developed its business on a reputation for professionalism and quality service. As ships’ agent, GAC represents more than 3,500 customers and handles close to 60,000 vessels annually through a worldwide network of over 300 offices and a presence in over 40 countries. It is due to the breadth of services that it can offer worldwide that the GAC Group has the financial strength, experience and economies of scale to offer a one-stop solution to customers across the globe. In this article, GAC’s group sales director of shipping, Neil Godfrey, gives his insights into the company’s role in the ships’ agents market, and a view of the shipping industry in general. Customs clearance, storage, inventory management and distribution, as well as freight contracting. All of these can be combined and augmented in a wide range of locations. Being able to offer these services globally, guaranteeing a high level of professionalism, reliability and accountability, is very important to the company and its customers. GAC is represented in thousands of ports worldwide, both established and developing, through a network of local offices and carefully selected local partners. This ensures expertise in local regulations, culture and business practice so that customers are able to maximize efficiency savings, reduce time in port and optimize their supply chain management. As a ships’ agent, this is absolutely vital. GAC works with an owner or operator to schedule an entire voyage, co-ordinate the support and services required and importantly, have a representative of GAC available to its customers at every stage of the journey. GAC’s global network of services continues to expand in response to its customers’ needs. In the past two months alone, it has opened new offices in Pointe Noire in the Republic of Congo and the Indian port of Pipavav. It has also expanded its operations across Europe with a number of acquisitions. A growing proportion of operations across the GAC Group relates to dry bulk and over many years, it has developed its offerings to serve the specific needs of the dry bulk industries. The company intends to grow this further in years to come. As a provider of shipping, logistics and marine services, GAC is able to co-ordinate the various links in the total supply chain which are involved in the handling of dry bulk ships and cargoes, through strategic partnerships with local operators, subsidiaries and intermediaries. Handling dry bulk cargoes is complex and it is absolutely vital that correct procedures are followed throughout the supply chain. GAC has the resources and economies of scale to oversee the process from end-to-end. Godfrey states that the main challenges facing ship agents are those that challenge its customers. 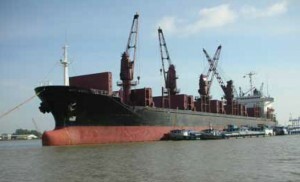 Restrictions on credit, finance and liquidity across the shipping industry restrict budgets. Owners and operators have to justify and scrutinize spend across the supply chain, minimize inefficiencies and ensure that they are getting value for money by contracting services responsibly to reduce risk. GAC knows that it is critically important to its customers that it can work with them to navigate the economic downturn by helping to manage their port calls or their cargoes, in order to reduce delays and cut costs. GAC has found that this is where its global presence and its portfolio of services become a real benefit to customers. By amalgamating services under one provider or agent, owners and operators are able to benefit from a consolidation of fees and closer management of the supply chain, resulting in efficiency savings and effective disbursement control across the board. The financial strength and stability of GAC is also of great benefit to its customers, who can have confidence in knowing that it is here to stay at a time when the shipping industry is experiencing a number of transitions at the hand of an unsettled global economy. benchmark levels of safety and service amongst its peers and competitors and to ensure that owners and operators are protected from unnecessary risks. This also means focusing on training a new generation of shipping, logistics and marine professionals, and encouraging people to enter the profession, which GAC is proud to do so through its state-of-the-art training programmes through GAC Training and Service Solutions (GTSS) in partnership with the National Maritime College of Ireland. Furthermore, the GAC Corporate Academy (GCA) ensures that GAC staff have access to first rate, purposebuilt training and are well-equipped for their roles. Ultimately, says Godfrey, the role of a ships’ agent is to ensure the safe, timely and efficient despatch of a vessel and its cargo. intermediaries delivering particular services. And this within a hugely fragmented and complex industry that offers different players at each port call and co-ordination of all parties by the owner or operator themselves. GAC’s competitive edge is to provide its customers with the ability to simplify the task of co-ordinating multiple processes and events, by appointing one company to do it for them. Generally speaking, the greatest cause of inefficiencies, delay or risk to dry bulk cargoes is a result of the transportation process being split, most often, between several parties. However, GAC’s partnership with vessel operating company Brobulk Ltd gives it a particular role in the dry bulk sector. It offers freight contracting services controlling chartered tonnage, primarily in the 15,000–75,000dwt range, carrying cargoes such as rice, sugar, agricultural products, steel scrap, iron ore and coal. This gives GAC the advantage of being able to offer an end-toend service and a total solution to its customers, through a package of services from across the shipping, logistics and marine sectors.